At this point you will make a trigger chart, which can be invaluable to you first in identifying, and later in anticipating, situations in which you might react as if the trauma were recurring. Give a piece of your journal paper the heading "Trigger Chart 1" and draw three columns. 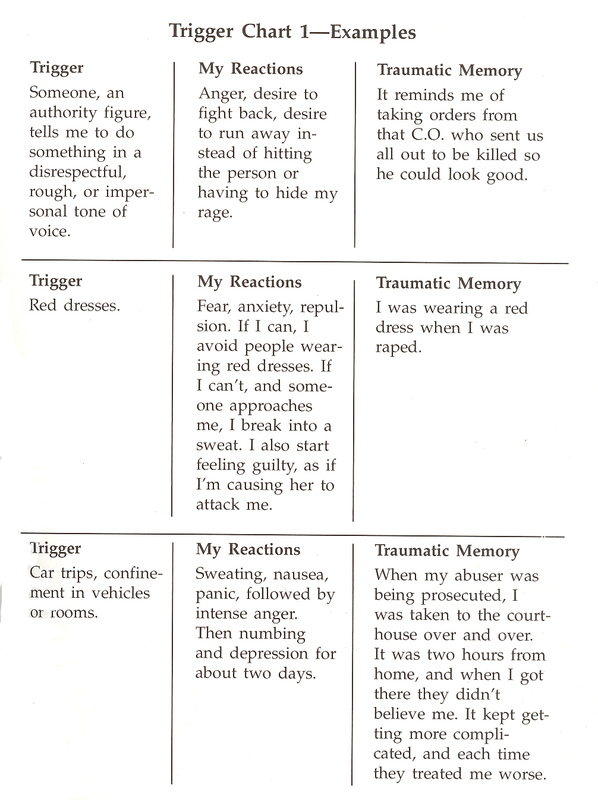 Label the first column "Trigger," the second "My Reactions," and the third "Traumatic Memory." In the first column list those times or instances when you feel the adrenaline rush to fight or run, or where you shut down or go numb, emotionally, physically, or both. Examples of triggers include smells, sights, sounds, people, or objects that remind you of the trauma or of events associated with the trauma. In the third column, try to trace the trigger to the original traumatic event, to a secondary wounding experience, or to an event associated with these experiences. If you cannot remember the original events, do not be overly concerned. The main point of completing this chart is to help you to understand and anticipate when you might be triggered. This understanding is the first step toward change and toward control. Take a look at the Trigger Chart 1 examples to get an idea of how it works. Consider sharing your chart with your family members and friends. They might be able to help you add instances to your trigger list. Also, sharing this chart will help them to understand you better and ease any stresses in your relationship. The preceding section contained information about constructing a Trigger Chart. Write three case study examples regarding how you might use the content of this section in your practice. What is the main purpose of a Trigger Chart? Record the letter of the correct answer the CEU Answer Booklet.